First of all, we would like to express our sincere gratitude for your support and patronage. Ever since the establishment of Amano Corporation, we have placed “People & Time” and “People & Environment” as our corporate theme, and customer satisfaction as the core essence of our business activities. All Amano employees work under the “customer-first” principle and will listen to customers. 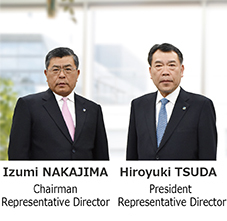 In addition, to make Amano an attractive corporation for shareholders and investors, we have placed the maximization of corporate value as the priority strategy for the management. Under the 7th Medium-term Business Plan, that was launched in April 2017, the Group's management concept is "The 2nd Stage Towards a 100-year Company-Innovative Creation of Value for Sustainable Growth," in which we will address four key issues towards achieving the goal of "enhancing our corporate value" while emphasizing compliance and further strengthening corporate governance as a foundation. As for the interim dividend, in accordance with our basic dividend policy and to show our appreciation for the continued support from our shareholders, we have decided to pay JPY25 per share as initially planned. Regarding the business environment for the second half of the current fiscal year, despite overseas political and economical uncertainties such as international trade policy, the Japanese economy is expected to continue its recovery trend as capital investment remains solid supported by strong domestic corporate performance. Under such environment, in order to maximize our corporate value, we will strive to achieve the business targets as one united force by steadily implementing the business plan, and while doing so, we will strengthen and expand our management foundation. Your continued support and patronage will be greatly appreciated. Copyright 1997-2017 Amano Corporation. All Rights Reserved.